At the recent regional ministry conference, where the Yambol, Sliven, Bourgas and Nova Zagora regions were represented, many reported exciting ministry results in various locations. Revivals broke in the villages of Kamenetz and Malomir, spontaneous prayer meetings arise often, while healings and various miracles are reported almost weekly. A water baptismal service for new believers is scheduled for the beginning in August at the Thundja River. In the midst of severe poverty and political unrest, the move of God has become a life answer for many. It is personally challenging when you see the weather and earth beaten hands of the man worshiping beside you and you witness the widow giving her last mite. Then when service is over you notice how the frail elderly ladies cover their heads with a white cloth so that the sun does not beat on their heads during their walk home. So to say that we spent our day ministering to those of the village churches is an understatement because it is those of the village churches whom ministered to us. Our last service ended in the afternoon and it was truly a special day. In years past, we have visited and ministered to a dozen different youth camps in Bulgaria. Each of them has been unique and special, but it has been a while since we have ministered at a youth camp where people have been so hungry to receive from God. We prayed for the healing of dozens of people. Many more were delivered instantly from various infirmities, both in soul and in body. Eight young people received the baptism with the Holy Spirit the very first night and many more were baptized in the following evenings. You could see parents and children praying for each other around the clock. One girl saw a vision of the “Heart of God” being exalted in our midst. As we continued with our next ministry appointment in the city of Varshetz, some stayed behind to spend one more day in the presence of the Lord on the top of the mountain. We will reconvene with them this week at the next youth camp organized at the Karandila Mountain near the town of Sliven. A lady of the worship team, who has played the violin in church all her life, scheduled for surgery that same week due to a bone-ligament condition was instantly healed during the prayer. Deliverance of multiple cases of headache, migraines and sinus were reported at the end of the alter service. As the church continued in several hours of prayer, around 9 PM a lady threw herself on the floor with screams and convulsions and was delivered from a demon. An elderly gentleman with a chronic condition in his vestibular apparatus due to a foot injury reported instant improvement and ran joyfully through the church. Several people reported improvement in their eyesight and hearing. Instant disappearing of pain and discomfort in bones, muscles, ligaments and chronicle conditions in back, hip and neck areas were reported during the prayer. A lady with a broken arm, who was watching the service live on the internet, later reported that her pain disappeared during the course of the service. Several people, who were brought to service from the local Dialysis Treatment Center, also reported instant relief. We are now waiting for doctoral reports as confirmation for the healings. Ministering at the Grace Church of God in Sofia, Catholic Ecumenical Apostolic Church of Bulgaria and the Gipsy ghetto of Phillipovtzyi, on the Westside of the capital Sofia. The brief sermons were followed by an hour long alter services in which we prayed for people and anointed them for their needs. Through the prayer a number of people reported various healings. A father and son we prayed for were respectively baptized in the Holy Spirit and delivered from drugs. Among many other healings that happened, one miracle in particular stands out. A father of a little girl came into the service requesting to be anointed with oil and prayer from for his two month old daughter whom he left in hospital with double pneumonia. He returned the next day to report that he girl was healed after the prayer and released by the doctors with a clean bill of health. We were pleasantly surprised upon our return to Yambol with a new healing report. During the Wednesday night service in Yambol the worship team always sings the old gospel song “There’s Power in the Blood” right before we minister the word. After the song a lady that plays the violin testified that some ten years ago, while ministering in Yambol we had asked for that same song to be sung before the message. She sang the song with the congregation while her left hand was quenched by a sickness not only causing her constant pain and discomfort, but disabling her from playing the violin. She testified that her healing a decade ago in one of our services was still powerful and real today. Little we knew that while she was testifying another lady in the congregation was suffering with a similar painful condition in the right side of her body disabling her leg and foot. During the time when we sung the songs and the testimony was presented she reported that she felt the presence of God in a very powerful way and continued to feel it through the next 48 hours. She later testified that God had healed her entirely from the pain and she confidently went to the doctor only to confirm that her condition had disappeared completely. In the beginning of February we began a Friday Night Healing Revival at the High Falls Church of God in Seneca. We committed ourselves to spend a month of prayer and fasting before God, studying and preaching the Word while expecting healings and miracles to happen. Services began February 2nd, as we invited other churches to join us in prayer and fasting expecting God’s miraculous intervention through a fresh experience of the power of the Holy Spirit. Several healings were reported as early as the first Friday night service. Other testimonies followed in the days to come, as people moved in faith and prayed during the altar services. This is no different than our ministry experience in Bulgaria in the past two years, where in the midst of numerous salvations and Holy Spirit baptisms, healings were reported on a regular basis. Just a reminder that God still has the power to save, heal and deliver. We have received responses from churches as far as Mississippi and Maryland who have also prayed and fasted for a move of the Spirit expecting miracles and healings. We are persuaded beyond a shadow of a doubt that in the beginning of the 21st century God is doing a new thing purposing a complete physical and emotional healing of his people. If your church has also prayed for a healing revival, please let us know how we can partner with you in this ministry endeavor. The itinerary of the small mission team contains the minimum of four weekly trips to villages in the area. They often hold up to twenty services per week as the team is always open for new opportunities for ministry. Their church meetings are often accompanied with miracles and healings, which have drawn many new converts. As last April in 2005 approached, we already knew that our presence in Bulgaria was needed and quickly prepared for our return. The days of ministry which followed upon our arrival in the country could have only been characterized as a miracle. As we continued to follow the leadership of the Holy Spirit, new doors for ministry were opened, new relationships were established and revival was revealed to the hearts of many Bulgarians as the new-yet-old paradigm for church ministry and personal growth. While watching how at times hundreds of lives were being touched by His move, our understanding of God and His power, our way of doing ministry and theology and our very lives and souls were slowly transformed to accommodate God’s heart for national revival emerging from supernatural individual restoration. With a desire to return back to Bulgaria for another term of ministry, we did not know when or how it would come to be. After much prayer and belief that 2006 is our year of promise, we took a step of faith to do what seamed to be impossible and began to prepare for our trip to Bulgaria. After taking this step, miracle after miracle took place in our lives. The first was the fact that we were able to get airline tickets less than a month before leaving that were cheaper than if we would have gotten them months in advance. Upon our arrival we again were blessed with someone to pick us up from the airport and take us to our final destination of Yambol. Though after arriving in Yambol we did not stay there long, for our schedule for the end of March and the coming month of April were already full. An elderly lady testified that in our service in Yambol last month, the sharp pain in her heart disappeared and she has not felt it since. Many more testified of miraculous healings and spoke of receiving a fresh touch from the Lord. In The Bourgas the family of a teenage boy on drugs was blessed through the miracle of his deliverance. The local church was able to participate in the process allocating resources to provide care for his recovery and spiritual growth. After the Monday night service of the revival we held in Sofia, a lady came to us and testified of a healing in her left arm where she had been experiencing tremendous pain to the point of not being able to move it. She further reported that during the service the pain completely left her body. While in revival services in Bourgas a similar healing took place. In the middle of the alter call, an elderly lady testified with a shout and with her hands raise to the Lord in thanks for a physical healing. This lady testified that before the service she could not move her arm or leg on one side of her body and that during the time at the alter she received an instant healing in which she was able to walk without hindrance and could move her arm and open her crippled hand. We held a total 33 services in 24 days in Bulgaria during the month of October as part of our 2006 Revival Harvest Campaign. Many were touched and transformed by the power of God while ministering during two revivals and a number of regional meetings and youth rallies in major Bulgarian cities. On Monday night during our last revival before our departure which was held in the oldest Bulgarian Pentecostal church in the Black Sea port city of Bourgas, a lady received her miracle and was healed from cancer. The case was later confirmed by her doctor. During the process of completing this article, “Verfolgte Christen” (“Persecuted Christians”) published a letter by pastor Vesselin Lazarov from Shumen, Bulgaria. He reported that a young man fell to the ground, dead at a Turkish wedding. People tried to resuscitate him, but without success. Then a church member prayed for him and called him back to life. As the man stood up, over 100 astonished eyewitnesses shouted “A miracle! A miracle!” These testimonies are only a few of over 600 cases of literal, physical resurrections, which have been documented in the past 15 years in Bulgaria. Virtually all of them have occurred in some relations to Bulgarian Protestant congregation(s) or minister(s). Is there revival in Bulgaria? I think this question has been already answered literally. In 2005, our team was successful in establishing several new congregations in Southern Bulgaria. The work was not without challenges from the particularity of the geographical location and the cultural setting which included: (1) ongoing migration of people between towns and villages, as well as internationally, (2) opposition from Eastern Orthodox priests and restrictions by local authorities (both described as illegal by the constitution) and (3) economical challenges and extreme poverty in the Bulgarian villages (especially through the winter periods). These factors often disable the local people and limit the ministry, as some of them are still ongoing and form the context in which the team ministers. Yet, Mission BULGARIA has been successful in establishing a growing number of new congregations and providing pastoral care for each of them every week. We were able to travel with the team every week and minister to the churches in the Yambol region and were encouraged by their testimonies of salvation, provision, healing and even bodily resurrection. Recently, we held another training seminar for the Yambol region. More than 80 local church leaders joined together. Prayer clothes representing the needs of the sick were brought to the meeting, and our team had received a number of healings reports. Among them, Shtiliana Paskova from the village of Leyarovo was miraculously healed of a tumor the size of a tennis ball, which had been determined by doctors as cancerous. Also, Maria Miteva received a vision during the prayer for healing, that God was healing her. Immediately after the prayer she felt that the long-years of back pain for which no medicine had been able to help her had miraculously left. Kamenetz Church 32 miles away from Yambolhas 50 members including the mayor. Cup & Cross Ministry Team has held 5 services per week there since February, 2000. Kozarevo Church 7 miles way from Yambolhas 58 members. Cup & Cross Ministry Team has held 1 service per week there since December, 2003. Leyarovo Church 38 miles away from Yambolhas 12 members including the mayor. Cup & Cross Ministry Team has held 2 services per week there since May, 2000. Lulin Church 28 miles away from Yambolhas 17 members including the mayor. Cup & Cross Ministry Team has held 2 services per week there since October, 2000. Robovo Church 38 miles away from Yambolhas 10 members. Cup & Cross Ministry Team has held 1 service per week there since May, 2000. Tamarino Church 30 miles away from Yambolhas 10 members. Cup & Cross Ministry Team has held 1 service per week there since December, 2002. Tchukarovo Church 52 miles away from Yambolhas 12 members including the mayor. Cup & Cross Ministry Team has held 2 services per week there since May, 2000. For the past two years, along with regularly-held weekly services, the Cup & Cross team in Bulgaria has been working on a survey purposing to establish the geographical location and historical background of all Protestant churches in the Yambol region. We are happy to announce that the completion of this survey was marked with a healing crusade in the town of Sliven. Our team has traveled and introduced our ministry to every Protestant church in the Yambol region and has compiled a detailed analysis which will become a part of our ministry strategy. On Friday, September 17, 2004 a group with one vision gathered for prayer and fasting at the church in the village of Liulin. Each of the leaders brought five people from his or her local church to participate in the day of consecration before the Lord. The day finished with a powerful church service in the evening which continued with testimonies and praise. The group then traveled to the church in Kamenetz where they continued the fasting through Saturday and then held a healing service in the evening. Genka Z. from the village of Pollyana, 46 years of age and a member of the village ministry team presented a need for healing of her two baby grandchildren. They were sent home from the hospital with severe stomachaches after the doctors were unable to diagnose them. On October 22, 1999 our team prayed for two baby clothes which were brought to the children. Approximately two hours after the prayer, the pain disappeared and for the babies stopped crying. Last year, the children traveled with our team to a water baptism service and quoted psalms. The testimony of the grandmother Genka, however, is even greater. In 2000, at the age of 42, she was diagnosed with lung cancer. The Bourgas Oncology Hospital sent her home in April of 2000 with no hope. The church prayed for her and she is still living today. In 2001, a heavy roof collapsed on her. She spent the next six months in a cast with the left side of her body completely paralyzed, praying for healing and for the salvation of her family. The church prayed for her again and the Lord healed her. It was then that she opened her house for the prayer meetings each Monday and Thursday. Today her whole family including three daughters, three son-in-laws and three grandchildren are saved. We held several training seminars as well as parallel prayer meetings. In the middle of the seminar on healing, a lady from one of the local churches stood and announced that she must leave the meeting because her husband who had a stroke was at home alone. Apparently, he was unable to move due to the stroke and needed her care. Her vocal announcement was the least to say discouraging for the healing hour of the seminar. However, the feeling of disappointment did not persist much longer. Several hours later as we were gathered in prayer, the same lady phoned the church where we were gathered to tell us that as she returned home from the meeting her husband had told her that he wants to get up and walk. She listened to him with disbelief since the doctors had said he may never walk again. That same day he slowly walked on his own around the house. The next day he was able to make several steps in the yard. God’s power followed his wife from the meetings to their house and healed him. The newer people who attended our meetings were strongly impressed by the numerous healings and the fact that none of the several hindered people who are members of our Christian movement is sick. Our prayers for healing are always supported by strong and continuous fasting. Now these newer people have began chain prayer and fasting in their villages and are constantly reporting of healings in their areas as well. Most of our recent meetings have turned to testimony services where people who have been sick just a week ago travel to our meetings to testify how God has healed them after the prayers of the Pentecostal Christians. In our last report we shared with you that at the training conference in February 2003, in the middle of the seminar on healing, a lady from one of the local churches stood and announced that she must leave the meeting because her husband who had a stroke was at home alone. Apparently, he was unable to move due to the stroke and needed her care. Her vocal announcement was the least to say discouraging for the healing hour of the seminar. However, the feeling of disappointment did not persist much longer. Several hours later as we were gathered in prayer, that same lady phoned the church where we were gathered to tell us that as she returned home from the meeting her husband had told her that he wanted to get up and walk. She listened to him with disbelief since the doctors had said he may never walk again. That same day he slowly walked on his own around the house. The next day he was able to take several steps in the yard. God’s power followed his wife from the meetings to their house and healed him. This lady brought her husband with her to the training conference on Saturday March 15. They both sang songs which the Spirit has given them in the past several months through which the husband has been sick and testified about God’s mercy and healing power. After the seminar a 53 year old lady from the church in Polyana, where we have been struggling to purchase a building for a church for almost two years, reported that the Lord healed her at the conference. All her life she has had severe heart problems. For years she has taken heart medications and followed the advice of her family doctor. The night after the seminar she had a dream in which a team of doctors dressed in bright white clothes operated on her heart. She woke up in the middle of the night feeling that the heaviness in her chest had diapered. In the morning, she threw away all her medications as she felt no need to use them any longer. Several days later she went for her regular check up with the doctor who she had been seeing for the past 15 years, and who for years had been recommending her for surgery. After the checkup he told her that her heart seemed to be completely restored and fully functional. Being familiar with her medical history the doctor was amazed how such a thing may occur. At the end of the Easter service we had a prayer for the sick. Several healings took place. A lady from the village with a severe lymph infection that had deformed her whole neck area was momentarily healed as the large nodes on her neck disappeared during the prayer and was witnessed by all present. The following Saturday, May 3, our team led the third Women of Godliness seminar this year organized in the Yambol area. The topics discuss were Mary Magdalene as the first witness of the resurrection and the women which Paul mentions in Romans chapter 16. We were unable to finish the second topic as the Holy Spirit gave a prophetic word to several ladies directing the seminar toward an all night prayer meeting. All through the night God dealt with the people who were praying as several were healed during this time. Since this spontaneous prayer meeting, many have testified of God’s miraculous power. Several miracles happened during the water baptism. A 52 year old lady from the village of Polyana with a ruptured disk who has spent the past several months in a cast was carried to the service to be baptized. She was healed momentarily. A 58 year old man from the Luilin church who has had a similar condition for the past 20 years due to a work injury was healed during the water baptism service as well. A lady with 75% blindness in both eyes received water baptism in the Black Sea. After the baptism she washed her eyes in the sea water with faith and God restored her sight completely. A couple from the Luilin church, who have been separated for several years, took water baptism together and made a commitment to restore their marriage vows. This is the fifth divorced couple whose marriage has been restored under our ministry in the past year. Many of the people of our congregations had been fasting and praying for this event all week. More than 200 people attended. Among them were presbyters and pastors from several congregations from the Yambol region. The meeting had three parts as the opening one was the presentation of the history of our ministry as well as our vision and strategy. Then a message on Christian living was brought in the second part. The third part included several testimonies of God’s power and presence. A great number of healing testimonies were presented as a result of three days of fasting which the people have undertaken. The conclusion of the third meeting included prayer for the sick as people were singing, “There is power, power, wonder-working power in the blood of the Lamb!” We were also able to provide lunch as time of fellowship before the closing of the conference. In the village of Bogovrovo, while the people were eating lunch several remained in prayer for a lady born with both her arm and leg deformed. During the prayer the lady through her cane away and began praising the Lord who had completely healed her arm. The lady is from the village of Polyana and she has been attending our services there for several months now. It had not rained at all in the village this spring. Several years ago as they experienced similar draught they called on our team for prayers. As we prayed for the village the weather suddenly changed and it rained for about 10 days. As the draught repeated this year several people in the village suggested they call on our team for prayer. The mayor of the village sarcastically noted that things like these are impossible. As our team arrived to Polyana, the people immediately asked us to pray for rain. It happened in exactly the way the village mayor had mocked. As we prayed outside the Orthodox Church building it started to rain. The whole village gathered around us to observe4 our prayer and to rejoice for what God had done. Tonka Dimitrova (age 31) from Zimnitsa healed from breast cancer. Velichka Panaiotova (age 68) from the village Vodenichane was healed from ulcer she had for more than ten years. Penka Boeva (age 68) from Lulin had a fractured shoulder seven years ago that did not heal properly and a pinched a nerve disabled the control over her right arm and developed into Parkinson. She was healed instantly. Shtilqna Paskova from Leyarovo (age 70) had a tumor in the left arm since the age of 23, severe kidney infection and osteonecrosis in the right leg. She was healed at the water baptismal service. Stoiana Dimitrova (age 70) with an atrophied right arm for 11 years was healed instantly. Maria Zheliazkova (age 66) from Bogorovo with long-term osteonecrosis – healed instantly. Genka Zlateva (age 40) from Polyana with muscular atrophy with a pinched nerve unable to move for 1Ѕ years, was brought to the meeting and was healed after the prayer. Todorka Atanasova (age 58) from Leyarovo with a severely damaged third spinal vertebra was healed after the meeting. Ginka Petrova (age 65) from Leyarovo with constant migraine and headache conditions since the age of five was healed at the water baptism service and reports that she has no headache since. As we reported in the last newsletter, our churches united in a prayer for rain. We provided a copy to each member with a special prayer calling on all believers, Protestants, Orthodox, Catholics, Jews and even Muslims, to ask God for rain. As a result, in the month of July every village where we minister has been blessed with abundance of rain. Among the several healing reports which we received in September one stands out among the rest. It is the testimony of a 68-year old lady who had been sick for many years. After supporting her in a 21-day fast in the middle of the night she felt a strong electrical power going through her body and heard a voice that told her, “Go and testify, God healed me, God healed me, God healed me. Needless to say she did not go back to sleep that night. Early in the morning she went to the doctor who after a thorough check-up certified a complete healing of the disease. This past Sunday we traveled to Pravetz for a coordinating meeting with pastors and members from the area. In the small upper room 64 were present not only from Pravetz but also from the towns of Botevegrad, Yablanitza, Etropole and I brought a short message on the Parable of the Prodigal Son, after which we had prayer for healing. People were coming to the front crying and kneeling wherever they found a place to receive prayer by the pastors. There was hardly any room to walk around the pulpit, as God poured out His Spirit and many were touched. On Wednesday we started the service with a new worship team of seven musicians and singers and then I preached on Galatians chapter three. During the altar service we witnessed a great outpouring of the Holy Spirit as many cried, prayed and received miracles from God. Another good report came from the small village in the Rodopi Mountains (Southern Bulgaria). The village is close to the Turkish border and it is completely Muslim. The only three Christian converts were Pentecostal. In the beginning of this week they were approached by the Muslim imam (local chief of the town mosque), who asked them of their faith. As they explained what they believed, the imam who was in a wheel chair said, “If your God is real he can heal me now, can’t He?” The Christians prayed for him right on the small city squire in front of the mosque and the village people. The imam was instantly and completely healed. It was reported that by the end of the week the mosque was closed because no one attended any longer. On Sunday we held a Communion service in the Pravetz Church of God. There, the more traditional for the Bulgarian Church of God style of taking Communion is still preserved, as it includes foot washing and a special prayer for the sick with anointing. After the service two reported instant healing. We have had services every day since July 9, 2002. Our team was able to start a new church in the Nedaialsko village. At first we began our meetings in the Orthodox temple there. As the congregation is growing rapidly, we believe for miracles among the younger people in the village. In another village, Kamenetz, the mayor sent us firewood to prepare for the coming winter. He and two other men cut and split the wood themselves and now we are ready for the winter. We have 5 services every week in that village. The believers have organized a continuous chain fast and prayer as God has answered many prayers, healed and given miracles in various situations. They are also very committed in helping our team. We had two meetings in Varna – on Saturday night in the largest auditorium in the city and on Sunday morning in the Evangelical Pentecostal Church in town. More than 3,000 attended. The Lord touched us all, as the Gospel was preached. Many were healed and testified in the services. On Saturday we had two meetings in the largest auditorium in Bulgaria at the National Palace of Culture. More than 7,000 attended as people came with buses from their local churches. More than 150 Church of God congregations were represented, as many of the visitors were from other denominations as well. We preached, prayed worshiped and ministered to the people throughout the whole day, as the Lord confirmed his Word with miracles and healings. The services continued on Sunday as well. At the later service some 300 men, women and children gave their lives to Christ. More than 40 people testified that they have been healed since we started the series of crusades four weeks ago. The most amazing fact is that God touched children who testified of their healing. My further work has daily included a few hours as coordinator at the Bulgarian Church of God Headquarters in Sofia and the participation of the last four crusades organized in the cities of Lom, Samokov, Varna and Sofia. The numbers total to more than 300 saved and 40 healed. I had to take a trip to my hometown Yambol this week to check on the ministry of the mission team there and to renew my driver’s license. On the way back to Sofia on Friday, we stopped at a town called Sliven nearby Yambol. As mother and I walked in the street a lady in her mid 40s stopped us and asked if we recognized her. I did not, but mother did and even remembered her name, Maria. Maria attended the church in Yambol a few years ago when I served as an associate pastor there. She had a large tumor-like mass in her back and the doctors urged her to let them operate. In one on the services, she said, I prayed for her and the Lord healed her. As she went back to the doctors a few weeks later, they could not find even a trace of a tumor or cancer formation. This past Wednesday night (November 28) we had the best church service since I have come back. About 150 were present and I preached on Revelation chapters 14 and 15. The text finished with the passage about the glory of God. Then God touched us. At the altars people were crying everywhere, kneeling and falling on their faces. Four were healed – one from severe headache, one from pain in the kidneys, one from heart problems and one from pain in the lower back. I praise the Lord for all these and expect even more reports. We’ve completed another successful term of ministry for 2015 marking a decade since the start of Mission BULGARIA in 2005 and also our 25th anniversary in the ministry. 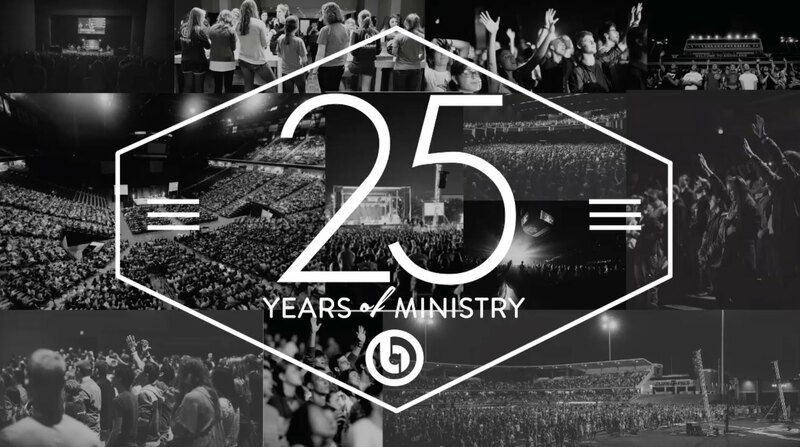 From humble beginnings in September of 1990, God has taken us to a full quarter century of ministry literally throughout the globe. As the Thanksgiving season is now upon us, we will be commemorating this event more extensively with a series called “25 Years of Miracles.” The series contains testimonies with various healings and miracles from our ministry, which we’ve collected and recorded through the years. We are grateful to the Lord for giving us the opportunity to preach the Gospel and be a part of your life through our ministry. Thank you for your partnership and friendship through the years and Happy Thanksgiving!